Very happy but not satisfied – that’s the feeling around Australian cricket following the third season of the Big Bash League. The first season with free-to-air coverage on Network Ten has delivered outstanding audiences and that is beginning to translate into higher attendances. However, the most important feature of the season is the number of families and kids evident at matches and we hope to have similar trends confirmed when TV audience data has been analysed. The BBL provides cricket with an opportunity to underpin the future of the game in Australia and that is the ultimate objective. We want cricket to be Australia’s favourite sport and to do that we need to inspire each new generation of Australians to become fans and players of the game. Research provided evidence that cricket was not as much a part of the lifestyle of boys and girls under 15 years of age as it had been in past generations. Both the social and demographic changes in our society meant that cricket needed to do something different to better engage with young people, females and Australians of all of our nation’s diverse cultural backgrounds. We needed to find a new way to get them into the game and the BBL is playing an important role in doing just that. It has been an ideal way of introducing new fans to cricket, with the aim, over time, to help graduate their interest into other forms of game. In building these interest levels and following of cricket more broadly, we will preserve our much-loved traditions like Test cricket, not ruin them. We want to ensure there is as much interest and passion for an Ashes series in 20 years’ time as we saw this year, but to do that we couldn’t just keep doing what we had for the past 20 years. Our research showed that sitting back and simply assuming that the next generation of Test fans would come was fraught with danger. We have seen other sports rest on their laurels and support fall away as people were drawn to other sports and entertainment options. Cricket was heading down that path and we couldn’t let that happen to our game. In BBL|01, 10 percent of fans attending matches were paying to watch cricket for the very first time. That increased to 13 percent in BBL|02. We are anticipating a similar outcome when research is in for BBL|03. It demonstrates that one of our primary objectives, drawing new audiences to the game, is succeeding. When the plans for the League were developed we were unapologetic in designing it to appeal to kids and their families. It needed to be a form of entertainment that was great value for money and an event experience that enhanced the cricket being played. We wanted families to come back again and again. Hence the music, fireworks, dancers and acrobats that support the boundaries, wickets and fielding. We appreciate these elements may not be every cricket lover’s cup of tea, and that’s fine, but BBL was never built to simply maintain the status quo. The measurable statistics tell us that the model is working, that kids and families are attending, watching the broadcast and having a great time. This season more than 650,000 fans attended BBL matches at an average of 19,000 per match. That compares well with ballpark figures for the NRL (15,000), Super Rugby (20,000) and the A-League (14,000). The BBL saw six matches with crowds that exceeded 25,000 and a high of nearly 43,000 attending the Melbourne derby at Etihad Stadium. The broadcasts were watched by a cumulative audience of just under 10 million Australians, at an average of 932,000 metro and regional free-to-air viewers, compared to AFL (821,000), NRL (953,000), and A-League (155,000). The Big Final was watched by an average of 1.5 million viewers and nearly 40 percent of matches saw the national TV audience exceed one million. Acknowledging that the BBL season is much shorter than other codes, these numbers nonetheless demonstrate that the league has become a serious player in the Australian sports landscape and clearly successful in the minds of its target audience. Raising the profile of Australian cricket’s next generation of players is another objective. The exposure of players such as James Muirhead, Nic Maddinson, Gurinder Sandhu, Aaron Finch, Ben Dunk, Josh Hazlewood and many others, has provided kids with new heroes and players with new opportunities. Players themselves have contributed more than just their on-field skills to the success of the league. Their engagement with fans before, during and after the game, the agreement to be mic’d up and support of the promotion of the league indicate their awareness of the importance of the BBL in cricket’s future success. Network Ten have brought a new voice to the broadcast of cricket. Their production of the game and the insights of the commentary team have been well received within cricket and media circles and ratings prove our fans enjoyed it too. On radio Fairfax Radio Network backed up their Test coverage with ball by ball commentary of the BBL and have added tremendous value to the coverage of the competition. The league was also supported by ABC Radio, which covered the final of the competition, and Southern Cross Austereo, which provided entertaining updates throughout the season. We appreciate that although fans have started voting with their feet and TV remotes, the BBL continues to have its critics, although there appears to be fewer of them and they are less vocal. The game has a specific audience in mind and like any targeted approach, there is the potential that some will not choose to ‘buy in’ to that offering. We are comfortable with that and believe we have a range of formats to appeal to Australia’s wide-range of cricket followers, from Test and Sheffield Shield, through to ODIs and the BBL. Of course, there is room for fans to love all formats. Management at the Australian Cricketers’ Association has made it known that it would like the BBL moved to an October timeslot. While CA understands the suggested rationale, our commitment to ensuring the BBL remains accessible to fans is paramount. We believe the December-January period, when much of the population is on holidays, is the time to do that. Our players understand this approach. The cricket fixture is dependent on a number of factors, many outside the control of CA, including when other countries agree to tour Australia. We have a tight season, due to weather impacts and ground availability. We do our best to ensure a coherent program but inevitably there are conflicts among priorities and compromises that must be made. CA has re-invested, back into the BBL, most of the broadcast rights fee received in the recent deal. We do expect that most teams will run a profit on their operations this year and this money will be reinvested in those teams or in the other cricket activities managed by their owners, the State Cricket Associations. 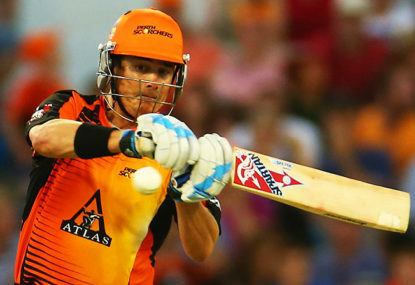 The BBL is an investment in the future of cricket, not the cash cow some commentators suggest. We are convinced that there is plenty of growth potential in the League and will be raising our expectations as planning begins for BBL|04. Now that we are able to engage with the entire country via Network Ten we anticipate that our broadcast audiences and attendances will continue to grow in the seasons ahead. We are very happy with this year’s results, but we’ll only be satisfied when the BBL is firmly established, contributing to the growth in cricket participation and following right across the country and ensuring it is Australia’s favourite sport and a sport for all Australians. In this exclusive column, Big Bash League project owner Mike McKenna continues the discussion with Roarers about the Big Bash League.